This is a fantastic little Qigong exercise for stretching and opening through the whole body, all the way from the fingers to the toes. It also introduces controlled breathing, in coordination with the movements of the body. It is a great ‘wake up’ exercise, filling the body with breath and allowing the blood and the qi to flow all the way to the extremities. Start with the feet together. Bring the mind to the body and relax. Sink the weight, feeling the feet on the ground. Allow the breath to sink to the belly and let it slow down naturally. Breathing in, turn the palms out and raise the hands at the sides of the body to clasp them together overhead. Hold the breath and rotate the palms to face up. Breathing out, push the palms up, stretching through the whole body. Left the heels to stretch to the tips of the toes if you can. Continue to breathe out as you relax the body. Come back to your pre stretch position with the hands overhead, palms up and the heels back on the ground. Hold the breath and rotate the palms to face down. Breathing in, release the hands and allow the arms to slowly and gently come back down to the sides of the body. Breathing out, relax and rest maintaining an open and balanced structure. Repeat these steps in succession for a few rounds. In the beginning, do not worry if the breath does not follow the movements so easily. It is far more important just to keep breathing! This exercise will relax and stretch the body and especially help lung capacity. Eventually you will find it possible to perform the exercise keeping long slow breaths in time with your movements. 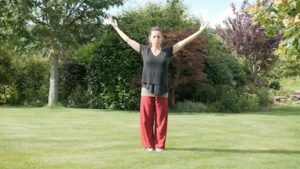 This article is part one of the series Introduction to basic Qigong for beginners.